This is a board game with cards for 2-4 players (or teams) to practise talking about likes and dislikes in English. 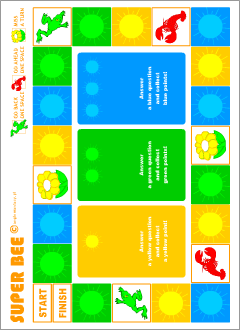 Print out a game board and cards. If you want, you can stick the printout onto the heavy paper. Laminate for future use. 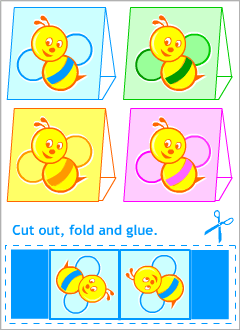 Cut out the individual cards, fold them and glue. Learn more how to prepare our double-sided cards (pdf). Before playing the game revise or pre-teach the names of all the items on the playing cards. Put task cards in three piles ( a yellow pile, a green pile, and a blue pile) face down. Take a turn by flipping a coin (heads = move 1 space; tails = move 2 spaces). 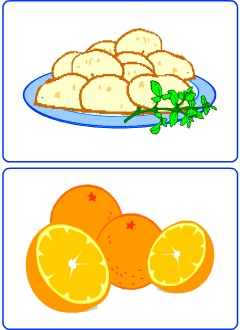 a blue square - pick up a card from the blue pile, then use the picture to make a question, for example, Do you like apples? Each correct answer gains three blue points. If you are right, don't move. Write down your score. At the end of the game, add them up for your total score. If you are wrong, move back one space. The player with the highest score is the winner. Our printables are in pdf format. To download them, you will need Adobe Acrobat Reader. 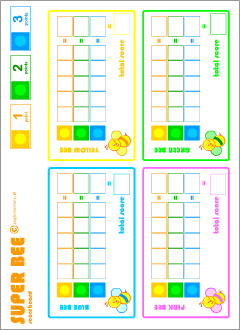 A board to play quiz games with task cards. Language tasks with different levels of difficulty. An optional board to write down the score of the game. Not mandatory for our games. Use buttons or pawns instead.